Facebook will be rolling out a big change to its business social media pages this month so before it goes live to everyone on 19th June here are some key points you should know about getting the most from the new layout. Firstly the good news is that the update isn’t going to require lots of content reworking and updating. In addition you profile and banner images shouldn’t need changing, but will be repositioned so it’s worth checking to see if they need to be adjusted. Where is my Facebook Management Panel? Page, activity, insights and settings are all organised top left and click through to pages with more data. To the right you have the build an audience feature as expected this does include a link to paid advertising, but also includes a feature to import contacts, which allows you to upload up to 5,000 email contacts. While on the surface this may seem helpful I would stress that Facebook will undoubtedly be using this to gather data plus the risk of these contacts being spammed makes this tool best avoided (use with extreme caution). This week’s activity is now nicely grouped to the right of your banner image and helps you quickly review your activity and engagement. It’s worth checking each area is optimised correctly for the new positioning, but as stated earlier this should only require minor adjustments. One of the big changes is that your posts are now in a single column gone is the staggered approach making visitors eyes dart all over the place. It’s now clearer which posts are the most recent and features like pinning are still available. However, the highlighter feature now adds a star to the post opposed to giving a wider profile. You can also see the reach of your posts with a handy bar below each item, if using paid promotion you can also see the comparison between your Paid and Organic reach. This new bar ads extra engagement data in addition to likes, comments and shares. 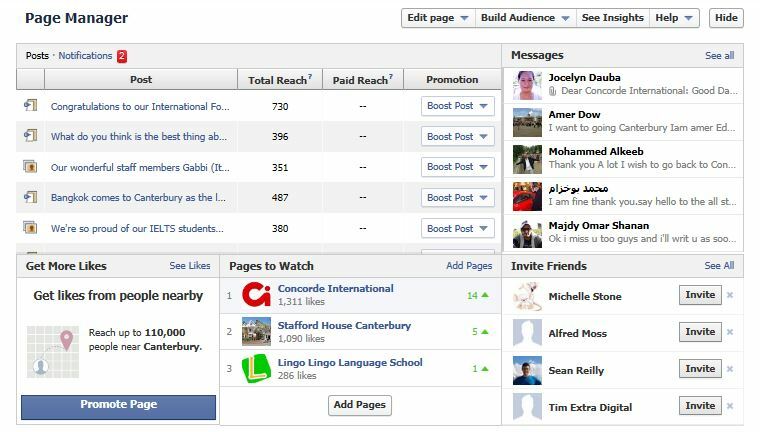 Next to the bar is a boost posts button which gives you instant data on paid post advertising. The plus side of this is that it is now very easy to pick your popular posts and run a paid campaign to give them greater reach. The downside is that it could encourage impulse post advertising which is great for Facebook, but not always so good for business. Any paid advertising including social media needs to be planned, organised and measured carefully so you get real returns for you investment. 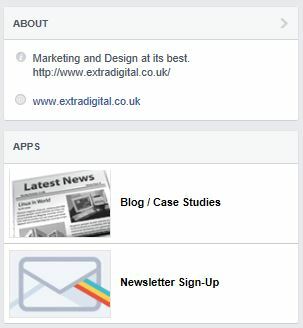 ExtraDigital can help you plan and run paid social media advertising to ensure you get the results you want call +44(0)1227 68 68 98 for more information. Although many of the Facebook business page changes are designed to boost paid advertising for Facebook on the whole the new business page layout and design is good. I like the post content being given a clearer focus and being able to quickly check engagement metrics is another great feature. As with any social media layout or design change its best to embrace these in advance and optimise your business pages before the change is imposed on you. This way you stay in control and your audience always see you looking at your best.